Members of the Long Journey Home Planning (LJH) Committee reunited at a special reception on Wed., Nov. 30, in Suzzallo Library, marking the culmination of the process to honor over 400 Nikkei students at UW that were forced by the federal government to leave campus and report to internment camps during World War II. At the reception, committee members celebrated the release of the Long Journey Home Booklet that includes biographical sketches and photos of more than 75 percent of the Nikkei students that were at UW in 1941-42. The booklet was completed in early November and hand-delivered to the honorees or families in the Seattle area for those whom contact had been made. Booklets were mailed across the country to known addresses of honorees as well. The reception also featured committee members sharing feedback and words of gratitude for all those involved in making the event a reality. 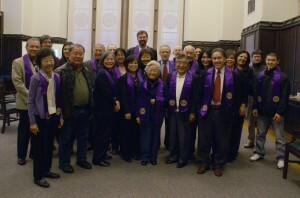 Members received purple stoles similar to those received by the honorees. The efforts to bring the ceremony together took several years and involved many campus and community individuals and organizations. The UW Nikkei Alumni Association, the UW Alumni Association, Department of American Ethnic Studies and other groups, including members of the local Japanese American community, helped to locate the former students. 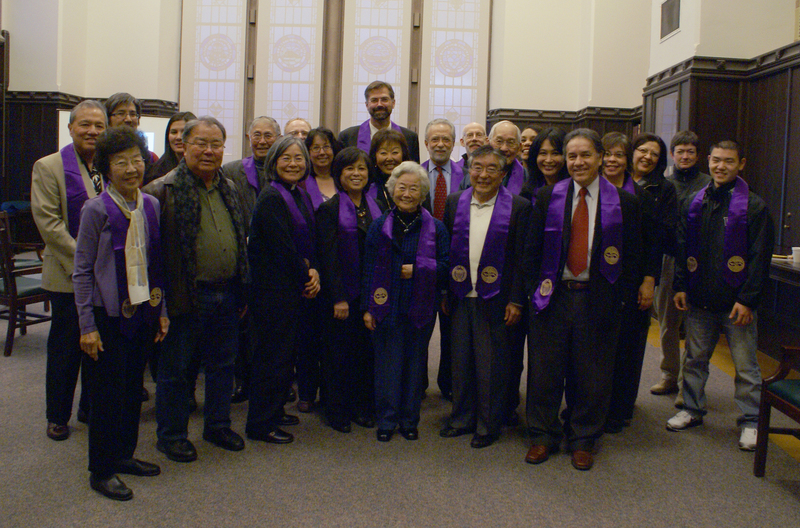 In 2008, American Ethnic Studies professors Tetsuden Kashima and Gail Nomura presented a resolution to the UW board of regents proposing the awarding of honorary bachelor’s degrees to those Nikkei students. The resolution was approved on Feb. 21, and the ceremony was held on May 18. Then-president Mark Emmert presented the honorary baccalaureate degrees and the keynote speaker was former Secretary of Transportation Norman Mineta, who was also incarcerated as a young boy during World War II. Nearly 200 Nikkei students or their representatives attended the ceremony. The event was webcast on UWTV and UW’s alumni magazine, Columns, published a two-part series about the impact of the 1942 internments on UW and the students. Part I and Part II are available online. The bios included in the LJH booklet are available on the UW Libraries web site. The LJH Planning Committee members are Diane Adachi, Norm Arkans, Carolyn Black, Chantal Carrancho, Shay Colson, Ed Escalona, Ellen Eskenazi, Kyle Funakoshi, Tom Griffin, Sara Griggs, Kashima, Beth Kawahara, Charlene Mano, Irene Mano, Tyler Mayeno, Todd Mildon, Stephanie Miller, Theresa Mudrock, Nomura, Julie Ogata, Glenda Pearson, Robin Perlas, A.C. Peterson, Toni Read, Ken Sato, Yuki Sato, Stephen Sumida, Kerston Swartz, Irene Tanabe, Richard Warner, and Jillian Yoshimoto.